Where’d I Get It: Purchased because Bree @ 1Girl2ManyBooks made me. Synopsis (From Goodreads): Around the world, black handprints are appearing on doorways, scorched there by winged strangers who have crept through a slit in the sky. My Thoughts: What is good? What is evil? The lines here are blurred and Laini Taylor shows us that things are not always as we perceive them to be. 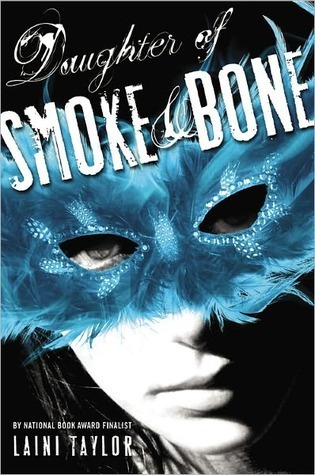 If at first Karou is a slightly unbelievable character, Ms. Taylor weaves her tale in such a way that all makes sense in the end. This is a story with plot threads twisted and arranged in a web so detailed and intricate that I feel we must truly only have been shown the barest hint of what is in store for Karou. It is a beautiful, terrible, wonderful tale of dark verses light, ‘good’ verses ‘evil’, of love lost and love gained. There is innocence and maturity. There is growth. There is pain and loss and redemption. The world building – yes, there is WORLD BUILDING in a Young Adult novel! – is fantastic. Though the angel verses demon theme could have quickly turned into a cliched debacle, Ms. Taylor pulls it off in a fresh and ultimately interesting way.. Kudos to her for that. And I just have to add that though the writing is simple enough for even the younger side of Young Adult to understand, it is in no way dumbed down. It’s simply clear, concise, and the flow is lovely. Good job, Ms. Taylor. I can’t wait to read the next in this series. I really need to read this one. Everyone raves about it. Great Review. This is definitely a special book. I loved it. Angel vs. Demon is not my favorite theme, but this book sounds so good. I’ll have to check it out.